Intermediate Bulk Container (IBC) totes are large containers used to store and transport liquids, viscous solutions and other fluid materials. All IBC totes that we have available are listed on this page. This entry was posted in Bulk Containers, IBC Totes on January 30, 2014 by madden_david. A pallet container is a plastic heavy-duty storage container. They are designed to reduce your packaging and shipping costs, as well as provide product protection. The sides of the collapsible bulk boxes can be released and collapsed into a compact and stackable unit. With the walls up, they are collapsible, stackable, made from durable HDPE plastic, with solid walls, and drop doors for easy ergonomic access. This entry was posted in Bulk Containers, Pallet Containers on January 30, 2014 by madden_david. Stack Racks are a collection of metal rails and pallet frames that are designed to allow companies to maximize storage space in a warehouse setting by creating vertical storage solutions. 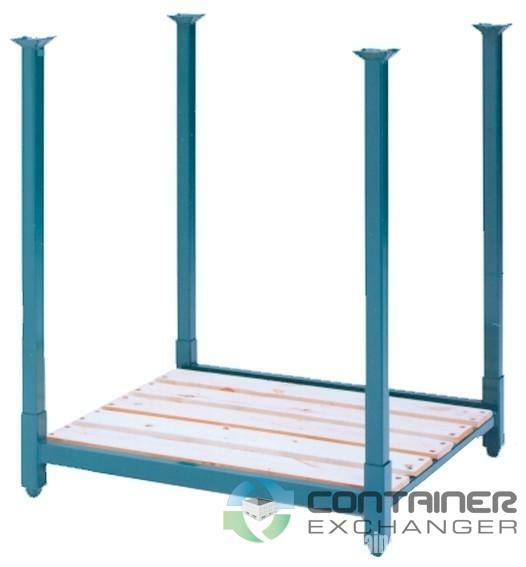 They are generally constructed from a metal pallet base with some have four upright rails that are connected to the base in order to create a framework for a vertical storage solution. In some models, the upright rails are removable, which allow them to be removed and stored flat to maximize space availability when they are not in use or are being transported from one facility to another. Other models have a rigid frame rather than removable uprights that allow for a staggered installation pattern. Regardless of the configuration you choose, stack racks offer the perfect racking system for warehouses that house a multitude of items from bulk storage options to longer products such as piping and lumber. The key drawback to using stack racks to maximize storage options is the cost. Purchasing new stack rack elements can be very costly, which makes them unattainable by some businesses. However, Container Exchanger offers businesses the ability to purchase stack racks used, significantly lowering the cost of acquisition and allowing companies to maximize their return on investment (ROI) when it comes to selling used stack racks. Companies in search of purchasing options for used stack racks or looking to sell existing stack rack systems simply need to contact Container Exchanger. Here you can set up an ad to sell or a wanted ad and get connected to a wide number of other businesses looking to buy or sell stack racks. For more information regarding what services Container Exchanger offers, how to list an ad to buy or sell used stack racks or to explore used stack rack pricing, please visit them online by clicking here. This entry was posted in Bulk Containers, Stack Racks on January 27, 2014 by madden_david. Why pay more with new wire baskets when you can save money with used wire baskets? Today, many companies are taking advantage of the significant savings with used wire baskets. With these savings, companies increase their bottom line. Companies can even add casters to used wire baskets for greater flexibility in their production systems. When the need for wire baskets is over, you can then use an exchanger container to resell them once again for more cash. Buying used and selling used all add up to more cash flow. 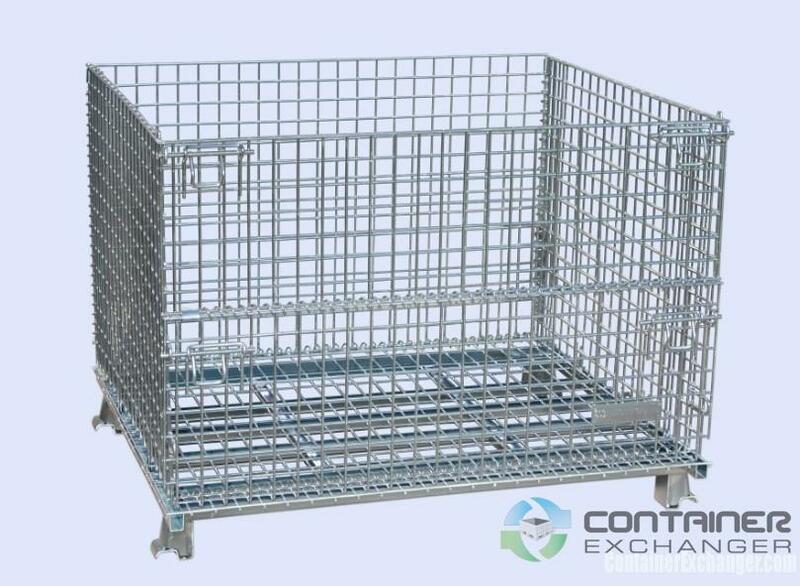 Used wire baskets are comprised of heavy-duty wire mesh bottoms and sides that deliver maximum product protection. They are excellent for fragile goods in transit or those goods in storage. They are also ideal for heavy products being shipped over long distances. Used wire baskets come in many different styles and fabrications. It’s easy to find the right style and design for your application. Choose from different load capacities, sizes and styles like mesh walls, stackable, drop doors and collapsible. The collapsible used wire baskets come in handy when you don’t use them all of the time or when there is limited floor space. Just fold them up and stack for a compact storage solution. These bins also offer an opportunity for companies to save money on shipping. When companies ship products, the cost is generally calculated on the weight of the shipment. The greater the weight, the more it costs to ship. Used wire baskets are lightweight and make shipping costs more economical. 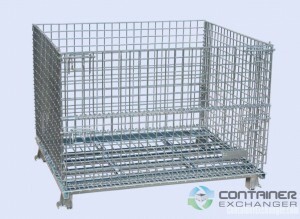 By purchasing used wire baskets, companies get more product to market while saving on both storage and shipping costs. Using these bins in your manufacturing and transportation systems is a savvy business decision. Whether you need containers for small loads or large loads, there is a wire basket to suit your individual needs. This entry was posted in Bulk Containers, Wire Baskets on January 23, 2014 by madden_david. Wood crates are still used as a container of choice for the shipping of products from overseas to North America. In order to meet the strict import laws, the wooden crates are required to be heat treated. Wooden shipping crates offer businesses an economical way to not only ship bulk material, including raw materials and finished products; they are also an effective bulk storage solution. They can be reused by businesses to store or ship their wares to customers or other companies anywhere in the world. If your business wants to begin using wood crates for storage or shipping, the most cost effective way to procure these containers is to make them yourself. However, the process of locating a wood crate pattern can be difficult and trying to make them on your own can be a confusing process. Container Exchanger has a viable alternative to both the expense of buying new wood crates and the hassle of making your own. Many businesses receive a large quantity of wood crates on a regular basis as they receive products and materials in them regularly. They often receive many more of these useful containers then they can use. Container Exchanger allows them to sell their unwanted used wood crates to businesses looking to buy them at a fraction of the cost of buying them new. This allows businesses to procure regulation wood crates cheaply while allowing businesses who sell them the unique opportunity to realize another revenue stream. And used wooden shipping crates are just the start. If your business is looking to buy or sell wood crates, look no further than Container Exchanger. Their large network of businesses means that they will be able to facilitate the transaction you need quickly and allow you to focus on the business of running your business. This entry was posted in Bulk Containers, Wood Crates on January 14, 2014 by madden_david. Pallets have become the darlings of DIY aficionados and Pinterest lovers. Yet there are many more options than the wooden pallets that have become so popular in up-cycling projects. Plastic pallets can offer businesses a cost-effective option for their shipping needs. Plastic pallets are made from structural foam or thermoform, and they offer a durable and easily manageable shipping solution. The pallets are designed to stack neatly on top of each other and to withstand far more pressure than wood pallets. Buying new pallets can put a crimp on your budget, no matter how necessary they may be for your business. Buying used plastic pallets can help you to get the materials you need for your shipping purposes while also keeping your overhead low to protect your profits. If you own an export business, you aren’t likely to get back any shipping materials that you can reuse, so buying used shipping products helps you to keep your costs low. You may be able to source used plastic pallets by forming a partnership with a larger business in your area who wants to unload their older pallets instead of dealing with recycling them. However, it is much simpler — and a more realistic strategy — to search for them online. Not all online retailers of used plastic pallets are the same, and quality can vary widely. It is important to find a retailer with a reputation for quality products and excellent service. 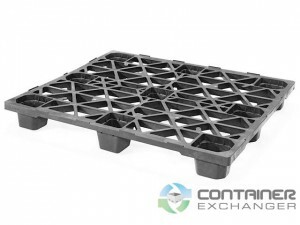 Container Exchanger works with a number of well-known companies, such as Stratis, Rhrig, Hampel, Linpac and Orbis to offer used plastic pallets for sale at some of the best prices. In addition, Container Exchanger buys used plastic totes and bins and offers to broker any used returnable packaging for your company. You can take advantage of a number of services to maximize the return on your investment, in addition to buying the used plastic pallets that you need. This entry was posted in Pallets, Plastic Pallets on January 9, 2014 by madden_david. Maximize your investment with savings of used bulk bags rather than new ones. Also known as flexible intermediate bulk containers and jumbo bags, used bulk bags are significantly lower in upfront costs and increase the bottom line. When you’re finished with using them, you can use a container exchanger company to resell them to a new end user as long as they are in good condition and haven’t been exposed to hazardous materials. In both the short run and long run, companies save money by purchasing, using and reselling used bulk bags. Used bulk bags are very strong and durable. They are fabricated from strong plastic and are woven together for long-lasting durability. Strong lift straps are attached to the top of the bag for easy loading and handling of the bag. They can be picked up with standard forklifts. Some styles even come with the ability to empty the contents from the bottom. Configurations may include spout bottoms, spout tops or flat bottoms. Who uses used bulk bags? Used bulk bags are often used by the food industry for the storage and transport of flour, sugar and salt. Pharmaceutical companies, construction companies, plastic industries and agricultural industries use bulk bags also. Bulk bags are designed to solve discharge issues, save space, provide easy filling and meet special material handling needs. These containers are ideal for both small and large scale projects. Used bulk bags are less costly and time consuming than multiple small ones. Because of its shape, space is maximized, which reduces handling and freight costs along with utilizing warehouse space more efficiently. Some even come with a special coating to reduce the risk of outside moisture and contaminants. These containers are safe and adapt well to many different scenarios. All around, used bulk bags are both convenient and economical. This entry was posted in Bulk Bags - FIBC, Bulk Containers on January 6, 2014 by madden_david. Today, many businesses are taking advantage of the savings with used pallet containers. Used pallet containers offer significant savings in upfront costs when compared to the price of new pallet containers. Prices can be as low as 5 percent for a comparable expendable solution. Re-use also reduces waste created by your company. Container companies only sell used pallet containers that are good condition and haven’t been exposed to dangerous materials. With used pallet containers in good condition, businesses save money while having their storage and transport needs met. It’s a win-win all around when it comes to savvy business decisions. 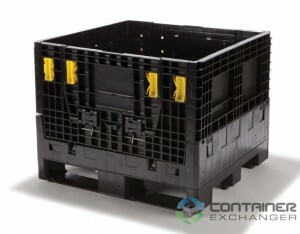 Used pallet containers can be implemented for a wide variety of industrial applications. Often, these large collapsible plastic boxes can be used to hold manufactured parts and bulk materials, such as appliance parts and automotive parts. Its sides can be released and collapsed into a compact, stackable unit. In the open position, pallet containers can be placed on top of each other along with providing product protection. These containers are made of a heavy-duty plastic, and some can hold over 2,000 pounds. For the most part, these containers are ideal for any product in a closed loop distribution system. Popular brands include Arca, Linpac and Buckhorn. Used pallet containers save companies money upfront and over the long haul. 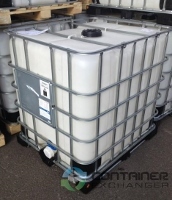 These bulk containers can be used over and over again between supplier and customer and within a facility. These containers can be used literally thousands of times. In the long run, used pallet containers are a cost-effective and sound investment when compared to purchasing cardboard containers or wood containers. When not in use, they are easy to fold for efficient storage space. Many offer drop doors on one or both sides and have forklift or hand-truck access. 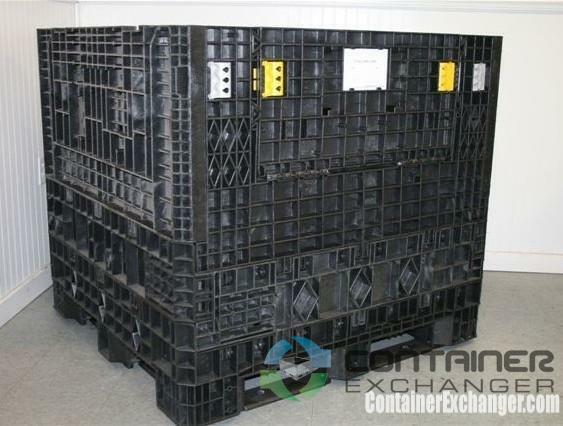 Used pallet containers are convenient and extremely durable. This entry was posted in Bulk Containers, Pallet Containers on January 2, 2014 by madden_david.